Semi-bluffing made simple at Deuces Cracked covers everything you need to know about semi bluffing, and then some more. That video is the perfect compliment to this semi bluffing strategy article. Watching your bluff get called hurts; it really does hurt a lot. Not only that, but repeated poorly executed bluffs eat away at your bankroll causing you to lose more and more money from one session to the next. Imagine if there was a way to take the sting out of getting called when you bluff. Better yet, what if you could take all your bluffs and almost instantly make them profitable? Allow me to introduce... the semi bluff. 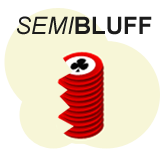 What is a semi bluff? A semi-bluff is when you bluff, but you still have a chance of improving to make the best hand on future cards. For example, raising with A 4 on a flop of K Q 2 would be classed as a semi-bluff. It’s unlikely that you have the best hand right now (making it a bluff), but a diamond on the turn or the river would give you a flush and the best hand (making it a semi-bluff). What’s the difference between a total bluff and a semi bluff? Total bluff = no (or very little) chance of winning the hand if called. Semi bluff = some chance of winning the hand if called. A total bluff has absolutely no chance of winning the hand if called. Therefore, it has 0% equity in the pot. Note: To be more precise, I’d go ahead and say that any hand with less than 10% equity can be classed a “total” bluff. Sometimes even the most clear-cut bluffs will have some equity for whatever reason. Semi bluffs have a decent chance of winning the hand if called, so they have at least some equity in the pot. As you can imagine, different semi bluffs will have varying chances of winning the hand, which means that some will have more equity than others. For example, semi bluffing with a flush and straight draw hand will have far more equity than semi bluffing with a gutshot straight draw. In general, more chance of improving = more equity. Semi bluffs can also only be made when there are more cards to come (so on the flop or the turn), as those unknown cards are what’s giving you the opportunity to improve. So no, you can’t semi bluff on the river. On the river, you’re either making a pure bluff (0% equity) or you’re betting for value and want your opponent to call. Semi bluffing diagram (range of semi bluffs). A diagram to highlight the types of bet based on your equity in the hand. A few important notes about this diagram. The less equity you have in the hand the riskier your bluff becomes. If you have little or no equity in the hand, your bet is virtually a total bluff. If you have more than 50% equity you should be betting for value and hoping to see your opponent to call instead of fold. If your bluff gets called, you’d much rather have a 35% chance of making the best hand than a 12% chance. It makes mathematical sense for a semi bluffs with higher equity to be more profitable than semi bluffs with lower equity, because you end up winning more often with a higher equity percentage. How important is semi bluffing? If you’re making a bluff, it’s far more profitable to make semi bluffs than pure bluffs. Try not to think of “total bluffs” as one thing and “semi bluffs” as another. They are both bluffs at the end of the day. Instead, think of semi-bluffs as the better version of "pure bluffs" or "total bluffs" - the good looking and wealthier older brother if you will. The advantages of semi bluffing. When you semi bluff, you still have the opportunity to win the hand. As a result, semi bluffs are inherently better than total bluffs. The fact that you have more equity in the hand with semi bluffs means you’re saving much more money over the long run. With total bluffs, you don’t have that equity cushion to help you when your bluff gets called. For example, on a board of QT3 it’s far more +EV to bluff with AK than it is to bluff with 72o. With AK your bet has fold equity + actual equity (overcards + gutshot). With 72o your bet has fold equity only. The more equity you have when you’re putting money in to the pot the better. In fact, in the example above betting with AK is almost certainly +EV, whereas betting with 72o is likely to be -EV. This is a prime example of how semi bluffs are better than total bluffs during play. Additional advantages of semi bluffing. It gives you the initiative in the hand. If you bet out instead of checking, you gain the initiative. This means that it’s more likely that your opponent will check to you on future streets, making your decisions a lot easier. It can disguise your hand. Some players will expect you to check and call with drawing hands, not bet and/or raise. Therefore, you may well win more when you hit your draw because your opponent is less likely to give you credit for having it. Good hands to semi bluff. Flush draws + open-ended straight draws. All of these hands have good amounts of equity against made hands like pairs, which is the exact reason why they are great hands for semi-bluffing. Bad hands to semi bluff. Care to take a wild guess as to why these aren’t great hands for semi bluffing? Yep, that’s right… they don’t have a lot of equity. Gutshot straight draws have poor odds of hitting, which means less equity. Weak flushes have a problems with reverse implied odds (even if you hit, you could still lose money to a stronger flush), which means poor equity again. Still, these hands are better to bluff with than a hand with 0% equity (or close to it). It’s just that they’re not as good as the ones above. Check out the percentage odds chart or the ratio odds chart to compare the odds of completing different types of drawing hands in Texas Hold'em. Read the full article on semi bluffing examples. This article is already long enough as it is. The examples in the article linked to above also cover the EV of bluffing with different types of hands with varying equity. Thrilling stuff. When not to semi bluff. Don’t semi bluff if you know your opponent is going to call. If you know that it’s very likely that your opponent will call your bet, it defeats the object of bluffing. If your opponent isn’t going to fold your semi bluff loses its fold equity, so all you are left with is your actual equity in the pot. Now, seeing as your actual equity isn’t that great because you have a drawing hand, it doesn’t make sense to put more money in to the pot unnecessarily. Evaluation of semi bluffing in poker. The best types of bluffs are with hands that have a fair chance of winning if called. Or to put it another way, they have a decent amount of equity in the pot although not being the best hand at the time. The more equity your hand has when running a semi bluff the better. Think of the equity behind you as a safety net. The more equity you have the bigger the net is, and the more money you will save when you fall (i.e. your bluff gets called). This is not to say that pure bluffs don’t have their place in poker. If you never make pure bluffs it makes you easier to play against, but I’m not going to get in to that here. Check out balanced ranges for more on that. But basically, if you’re not fluent in when and when not to bluff, you’re far better off making semi bluffs than pure bluffs. If you’re a beginner poker player, simply swapping pure bluffs for semi bluffs will increase your win rate (or lessen your loss-rate) significantly.